Adopter categories are a classification of users based on their eagerness to try out a new innovation or a new product. It is related to the diffusion research which we have discussed earlier. It has been applied to a number of studies, including marketing, organisational studies, knowledge management, communications and complexity studies, among others. While this study can seem a bit high-level to you, it has serious real-world consequences on how technology products and services get adopted. 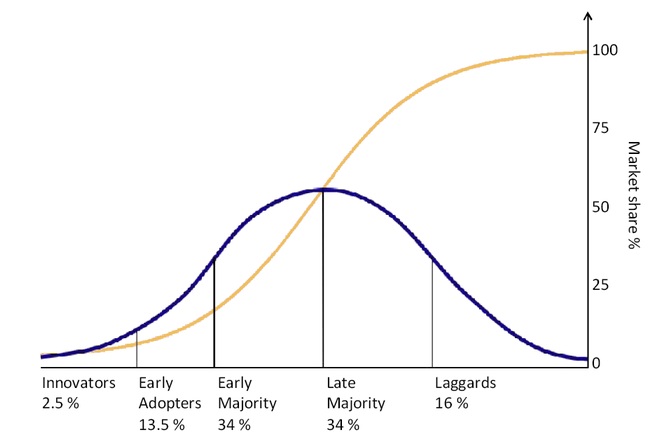 Many entrepreneurs and marketers fail to understand that you must move from left to right in the adoption curve which is explained below. As a result, they drastically exaggerate their market capacity. They also fail to determine how much work and time will go into implementing a disruptive idea into the mainstream. The adopter categories were first identified and described in the benchmark book “Diffusion of Innovations” by sociologist Everett Rogers in 1962. The end result of diffusion is that people, as part of a social system, adopt a new idea, behaviour, or product. Adoption means that a person does something different than what they had before. For example, the purchase or use of a new product, accommodating new behaviour, etc. The key to adoption is that the person must recognise the idea, behaviour, or product as new or innovative. It is through this that diffusion is possible. According to Rogers’ research, there are five adopter categories. They are innovators, early adopters, early majority, late majority and laggards. He identified the key characteristics of each adopter category. In Rogers’ adopter categories, he admits that not everyone holds the same motivation to embrace new technologies. The concept of adopter categories is widely used in present-day marketing, especially when it comes to innovative new products or services. Adopter categories are especially also relevant in the area of social network analysis. Characteristics: how do they look like? These adopter categories fundamentally depend on the mindset, as well as the customer’s lifestyle and product interest level. Innovators have an appetite for risk. They are the first ones to adopt a new technology or idea at its very initial stage. Innovators love exploring new things, even if they run the risk of failure. They are usually the younger ones having the highest social class and have great financial advantage according to Rogers. They definitely have the closest association with scientific references and interact with other experts and innovators. Their financial resources give them the ability to sustain the possibility of failure. Innovative customers are less subject to the word of mouth marketing. Regarding the particular product category, they tend to have a higher level of knowledge, confidence and curiosity in the product. Early adopters are often the opinion leaders. They are the go-to people when you need to check with a new technology or product. Their opinions matter. Unlike innovators, they do not like taking the plunge. This is the second fastest category of users who adopt an innovation. They have similarities with innovators on the aspects that they also have the required knowledge to assess technology, and have more financial stability. But they also conduct their own research on the technology, listen to other user’s experiences before they arrive upon an opinion. Thus they also reduce the risk of their purchase compared to innovators. Opinion leaders formed by this group of early adopters are seen as experts by other customers. They tend to create trends. These opinion leaders have bigger social networks and contacts than innovators as innovators tend to make their purchase decisions irrespective of others. Therefore, early adopters form the foundation to gain widespread adoption of a new product. In fact, the growth phase is triggered by purchases from early adopters. They are already aware of the need to change and very satisfied adopting new concepts. Strategies to appeal to this community include how-to manuals and information sheets on implementation. They do not need data to persuade them to change. Users in this category adopt an innovation after a differing degree of time. This phase of adoption is significantly longer than the innovators and early adopters. The early majority rely massively on positive feedback from experienced customers. They are more cautious with their investment. They rely upon social influence to help defend their decision making- both for the product itself and for the particular brand selected. This group makes conclusions based on convenience and practical gains over the “cool” factor. Strategies to appeal to this collection include success stories and evidence of the innovation’s effectiveness. Therefore at this stage of the market’s development, we have a shift towards market stabilisation. The feedback from the categories discussed so far is now proposing or recommending certain brand preferences for the particular new product. The late majority shares some traits with the early majority but is more careful before committing. These people are skeptical of change, and will only accept an innovation after it has been tried and tested by the majority. Until they see the product is used widely i.e. in retailers and in people’s possession, they are hesitant to adopt it. Typically late majority group has little financial flexibility. They are in contact with others in the late majority and early majority. The users have very little opinion leadership. They try the product in its late growth and maturity phase. Strategies to get this population on-board is to include information on how many other people have tried the innovation and have adopted it successfully. This group is the last in the social system, to adapt to new ideas or technology. These people are obliged by tradition and very conservative. They are very skeptical of change and are the hardest group to bring on board. They tend to adopt only by force or when they see that everyone else around has already adopted. In some cases, the customers may not use the product at all. Their conservative nature prevents them from changing their purchase behaviour. This group usually include elderly people. For example, some of these consumers may still have a VCR that they have maintained for many years. They may be disturbed by choosing new technology and learning new things or they simply may have an inclination towards stability. Either way, laggards are generally not an overly engaging target. Sometimes usually not worth the effort to analyse and convince their thinking. 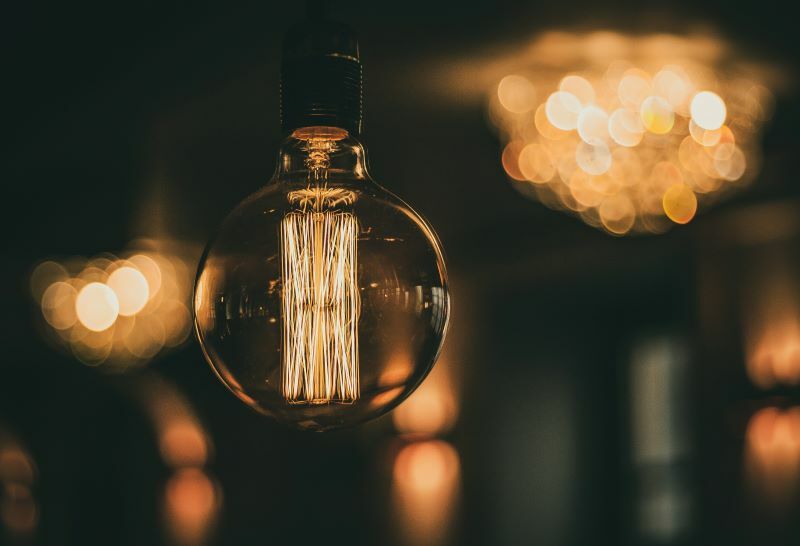 From a marketing perspective, one can consider that there is a share of customers that are likely to avoid new product and any form of innovation. Strategies to appeal to this population include statistics, creating a feeling of urgency, and influence from people in the other adopter groups. Blue represents – the groups of consumer adopting new technology. Yellow represents – the market share which reaches 100% following complete adoption. This is the point of market saturation. When comparing these groups the advancement of adoption clearly is gradual and logical. Most marketers and business developers find that linking the gap between early adopters and the early majority is their most tedious task. It denotes a significant change in practice to adopt something because it is new and cool. Then progress to deciding and adopting some new innovation because it is valuable, beneficial and productive. It is essential to note that users do not always turn up as “Innovators” in all spheres of their decision-making processes. For example, people may adopt very advanced green technologies for their home with solar heating. At the same time, they may not belong to an online social network or own a smartphone. People travel back and forth across the curve in a larger picture. Where people lie in the curve, is based on the pain points they are currently trying to address and their interest in the foundations of the change introduced. Have you figured out where your customers lie in the Bell curve? Leave us with your feedback or let us know if you have any questions.